The production was founded in 1998. Our company is the only manufacturer of chuch-hela in the world, that has its own vineyards. 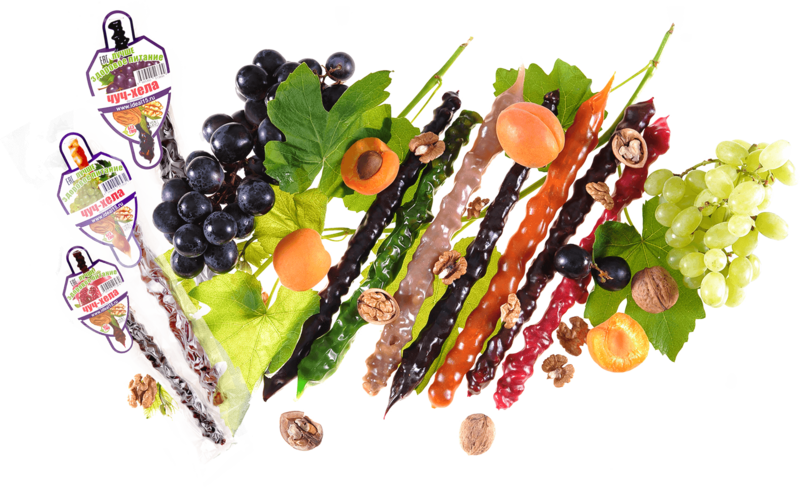 We produce chuch-hela in vacuum packing without a thread, following traditional technologies and using only natural ingredients. It is the reason we position ourselves as a healthy food product! 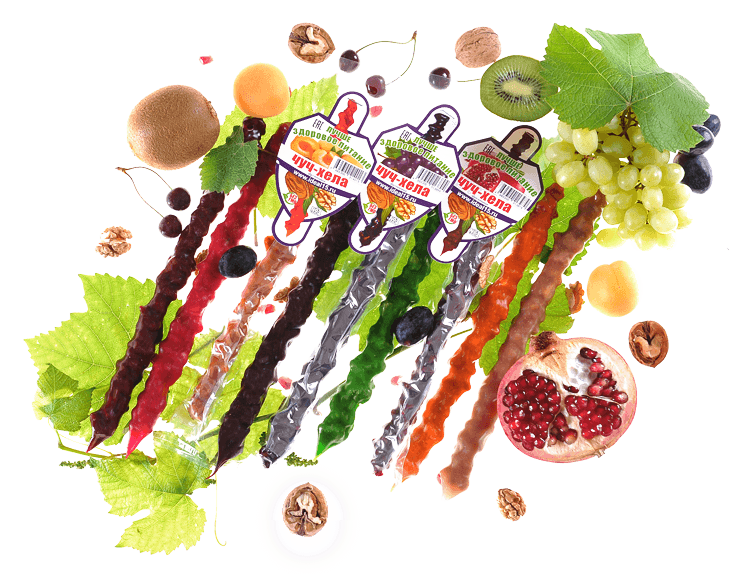 The chuch-hela and the fresh or condensed grape juice normalizes blood pressure and reduces the excess cholesterol level, improves the condition of blood vessels, normalizes the exhausted heart and, due to the content of biogenic stimulants, strengthens the mental activity, reduces fatigue and improves metabolic processes in the human body. The pure drinking water from the with mountain slopes of Caucasian ridge and our own vineyards - that's the whole secret! Using centuries of experience, we produce our products solely by traditional technologies and recipes. Manufacture is located in the homeland of the product and has no analogues. The use of vacuum packaging solves the problem of hygiene of products and allows to store them for 6 months at least. 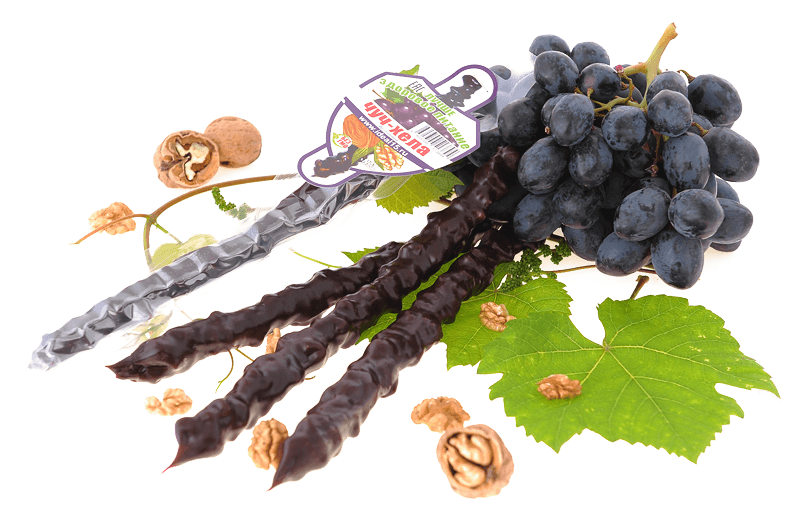 The Chuch-chela with black grapes and walnut – is a tasty and useful delicacy. Black grapes gives the product a sweet taste and aroma. The walnut adds the dish some piquancy and makes it maximally useful. 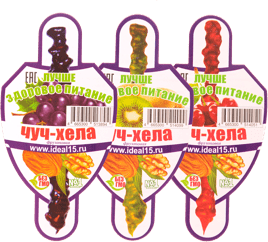 We sell chuch-chela 50 pieces in a box (99 rubles for 1 piece). 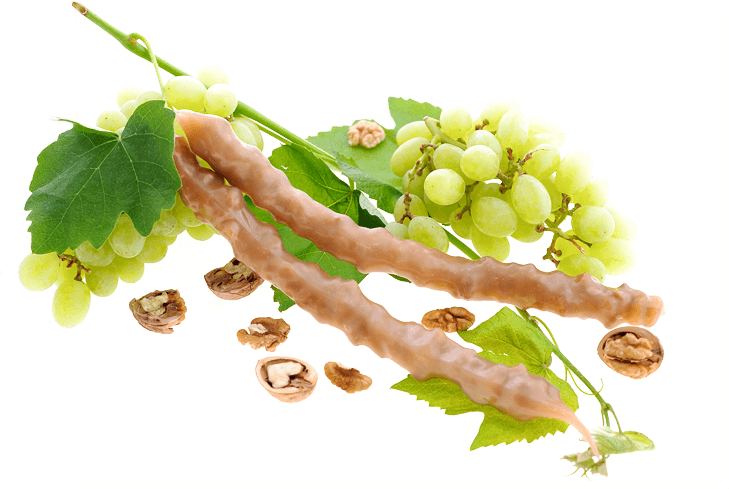 The Chuch-hela with white grapes and walnut – it’s a completely natural dainty. The sourness of the white grape juice accentuates the taste of the nuts. The Chuch-hela based on pomegranate juice with walnuts is a delicious natural delicacy. It has a light sourness and a pleasant pomegranate taste. The Chuch-hela with apricot and walnut has a rich sweet taste of ripe apricots and light taste of nuts. 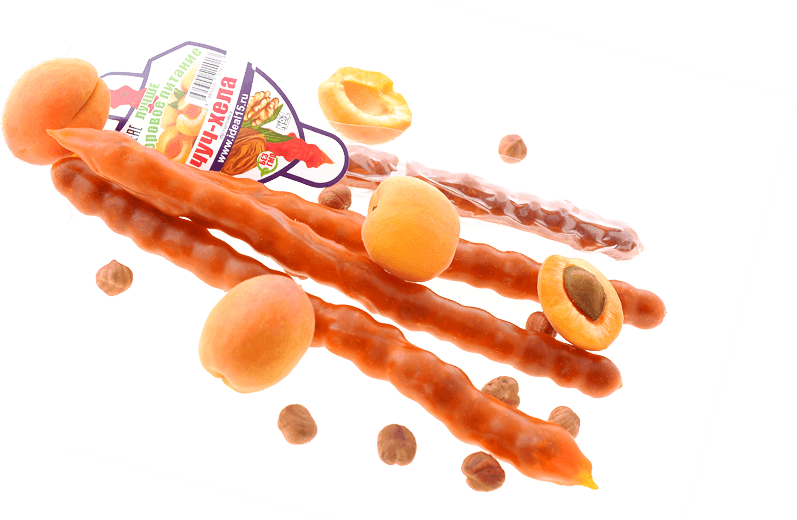 This delicacy will not leave anyone indifferent. 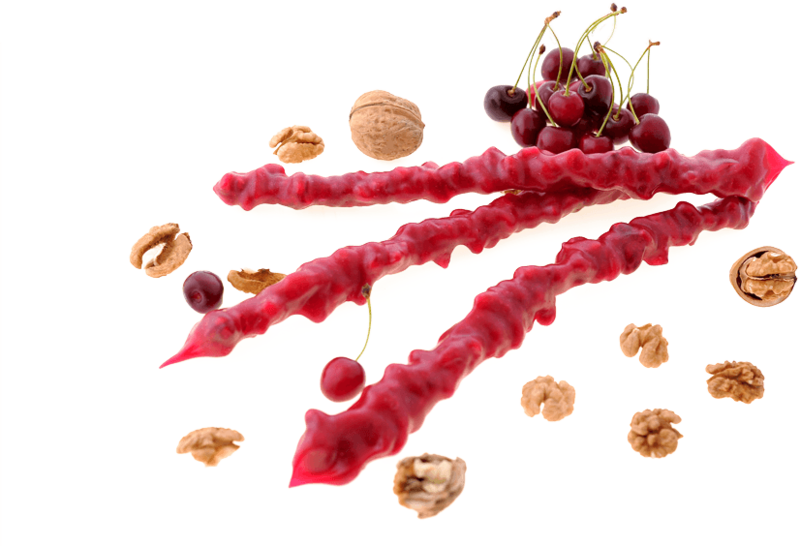 The cherry Chuch-hela with walnut is a soft and sweet treat, which has the aroma and taste of ripe cherry and is an excellent way to raise the mood. The Chuch-chela with kiwi and walnuts is delicacy with a sweet flavor of tropical fruit. 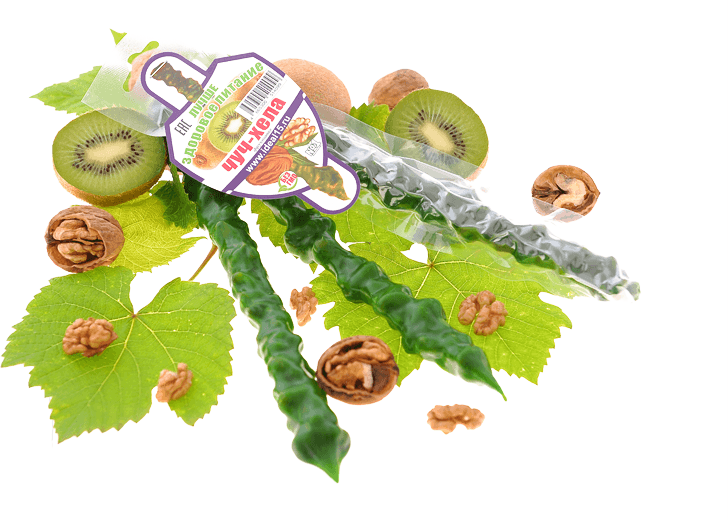 You will be surprised by the unusual combination of kiwi and walnut. The made dish of all types of production we produce by your choice. The ecological culture of the personnel, based on mentality and education led us to a completely non-waste production. The quality of the product responds to the highest world standards. Our specialists are in love with their deal, they live by working and see the meaning of life in their activities. We highly appreciate the cooperation and attach the maximum effort to make it more pleasant. Our production was founded in 1998. 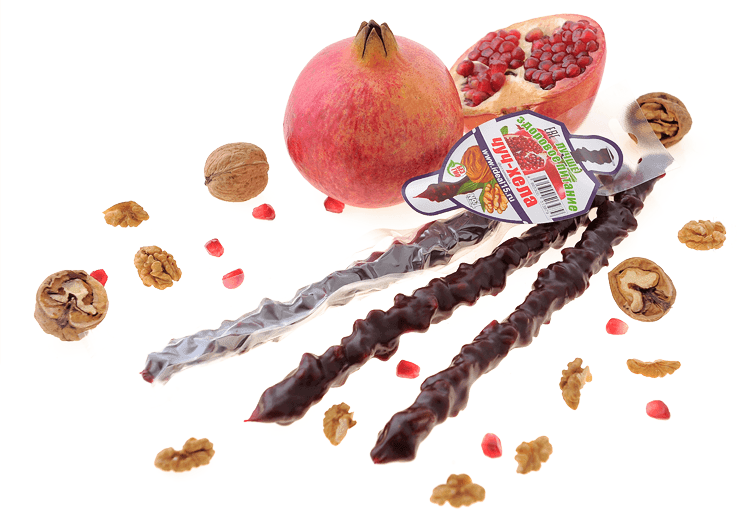 We develop in step with the times and offer our customers a wide range of products and a variety of packaging, establish and maintain long-term relationships with our partners, guaranteeing the reliability of cooperation and expanding the geography of sales. To provide as much as possible number of people with healthy and natural food, using traditional recipes of manufacturing. Unique ancient recipes, Highly qualified specialists, Natural Ingredients, Multistage quality control, Reliable partners. The delivery is implemented within the time frames specified by you, in the way convenient for you, anywhere in the world by transport companies or the own transport of the enterprise. You can choose and carry out any convenient payment: cash, non-cash transfer, bank cards etc. I've never ate anything more delicious, despite I’d traveled all over the world, I’ll never stop loving it! Russian products are all very, very tasty, specially this one. As a result of a trip to the fair in China, I met the charming lady Natalia, who offered to try this product. Chuch-hela - the taste of childhood, I really liked, especially when I learned about its beneficial properties; Me as an athlete - it's very important. © ООО «Chuch-hela». All rights reserved.